where I visited 12 parks and rode 42 roller-coasters, including my 100th. "If I could save time in a bottle...."
Shawn McLaughlin and I left Cindy Stout and Michigan's Adventure, our coaster fantasy realized, and made our way down to the Windy City of Chicago. Once we entered the city Shawn somehow got separated from me and wound up in the red light district. After having satisfied his sexual fantasies as well, he managed to find his way back and we spent the night at the Days Inn Disaster Midway Airport. I swear, not only is this part of town unseemly, the Days Inn Disaster is filled with as many shady characters as you could possibly imagine. Walking down the hall, we immediately heard a couple fighting. Loudly. Drunkenly. We got to our room and directly across the hall a small dog was barking non-stop. I opened our door and found yet another reservation screwed up. I reserved two beds, they gave us one. We walked back to the front desk and demanded another room. Only one room available, it only had one bed but at least no dog across the hall. Shawn and I had a fun night looking through coaster magazines. He was on his way to Six Flags Great America the next day and I would be flying to Pittsburgh! The next morning I said goodbye to Shawn and tearfully bid farewell to my beloved Isuzu Esteem. I boarded the plane for Pittsburgh. It took me fifteen minutes to get out of bed that morning. Now normally saying something like that would not be a big deal, but I mean it actually took me that long just to physically lift myself up and get my feet on the floor. It hurt just to breathe and it now felt like my lungs were bruised. Still, once I got going I managed to get used to it as I didn't try to cough or blow my nose or anything bad like that. I knew I might not be able to ride the coasters, but I figured today would be a good "off" day anyway. The parks I was visiting were supposed to be small, family type parks, so I figured most of the rides would be of a fairly gentle nature and if nothing else, I could always walk around and take in the atmosphere. I headed toward Idlewild. I had consulted with many RRCers about how to schedule this particular day. Dana Schwartz was quite helpful in reassuring me that all three parks were doable. I was told two hours at each park would probably be enough, and the drive time didn't seem to be that time consuming. The drive to Idlewild was nice. First of all I don't have to be hit over the head with a frying pan to figure things out - I upgraded to a Toyota Corolla WITH cruise control, thank you! Secondly, the drive itself was spectacular. The trees got bigger, the hills got hillier and the road got roadi... no, it got more winding. 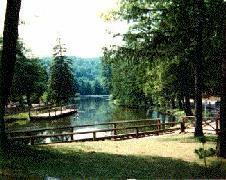 By the time I reached the park I really felt immersed in Pennsylvania mountain country. Pulling into the parking lot, I could tell right away this was different from any other park I'd visited before. It was more downhome, more small town, more friendly. And I can tell you right now I had a big smile on my face from the moment I opened my car door until I left the park. It was wonderful not knowing which way I was going or where I was headed. This looks like it might be the back of the park. No wait, it's a children's area. No wait, it's a picnic area. My God!!!!!!!! I can't believe all the people having picnics here! There are families running around all over the place! Photo courtesy of Teresa Weimer Ohhhhhh!!!! How cute!!! 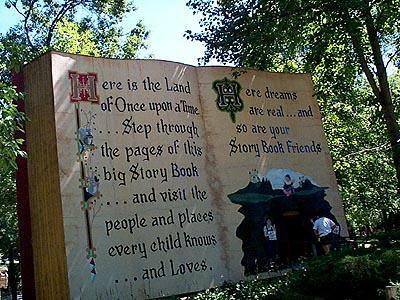 A giant book with an opening at the bottom of the page just big enough for children to enter. Oh this is too cute!! I stopped and watched little kids *running* to the book, then turning back and coaxing their moms into hurrying. I was curious about the book but I wanted to keep walking and just take in the atmosphere of the park for awhile. And that's exactly what I did. I took in everything. I went into Hootin' Holler and watched a man sitting on a rocking chair playing the banjo. I watched a little boy rock himself to sleep. I saw a young couple share a kiss while leaning against a bridge. I took in the train whistle, which sounded so authentic. I looked at the railroad post marked "Idlewild." I watched a gorgeous waterfall and walked along a creek that ran through Hootin' Holler. I read the menus outside every restaurant. I saw an old man sitting at the top of a steep hill in front of a big beautiful pavilion, then found myself delighted when I discovered the nearby rides that had been hidden within the park. I watched people sitting on park benches *everywhere* and thought how perfectly placed these benches were and how the people sitting on them actually enhanced the atmosphere of the park. I sat on a bench near the Carousel and ate a sno cone and became a part of the atmosphere. I watched the gentle ferris wheel and thought it was the most romantic looking ferris wheel I'd ever seen. I marveled at all the bunting throughout the park. For a good 20 minutes I watched the river that cut through the park, all the while taking in the activity surrounding me. I watched the ducks swimming in a pond, with the waterpark serving as a backdrop. Photo courtesy of Theme Park Review I walked on a carpet of fallen pine needles. 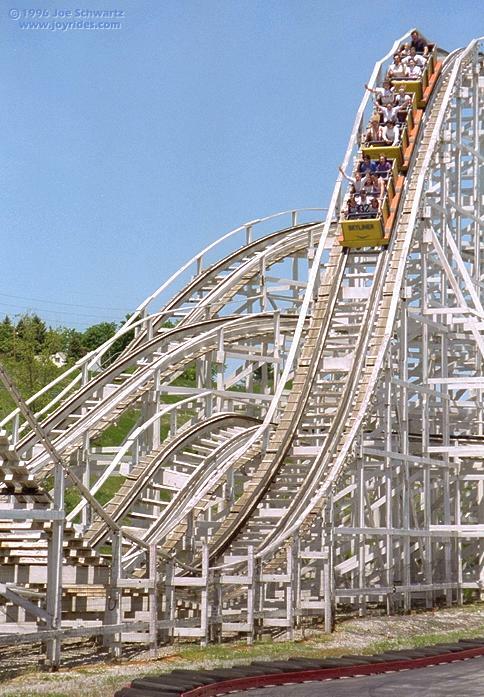 I rode my first Wild Mouse and was completely intrigued by the tilted lift hill. I grabbed my side as the intense lateral forces took me by surprise. 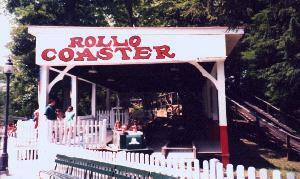 I rode the Rollo Coaster with a nine year old boy who was afraid to ride alone. I laughed as he bravely let go of the bar and put his hands in the air and screamed with delight. He laughed at me as I winced from the pain and ended up holding on to the bar, reversing our roles. And before I left the park I stopped to watch children climb on a giant rope wall as adults walked across a swinging wooden bridge. Throughout my stay at Idlewild, reunions of all sorts took place. People who hadn't seen each other in awhile would greet one another with hugs and how are yas, familiar faces stopped to have brief, casual conversations. Families walked around together in groups, and mothers weren't yelling at their kids. I saw very few teenagers running around, this isn't a typical place for them. This is a place for families to regroup and reunite. Attitudes seem to change dramatically in this place. I have never been so surprised by a park as I was on this day. I breathed Idlewild. This was a park I will never forget, and so special is it that I ended up spending more than five hours there. I only rode two rides, both of them roller-coasters. But it was the exploration and discovery of each surprising part of the park that made it so special to me. 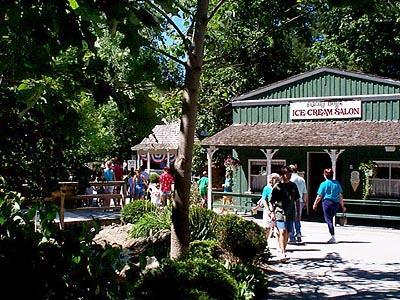 What a wonderful place for families to visit on a Sunday afternoon. There's simply no better place to spend the day with those you love. I got in my car and drove in a daze to Altoona. It would be impossible to top this place and I had no such expectations about Blands or Lakemont. I decided to visit Blands first because it was dinner time and I hadn't eaten in 24 hours and I heard Blands had good food. Kind of a funny name for a park that prides itself on having good food, although in Minnesota, where the state motto is "not too spicy now," bland would be considered a compliment. It's off the beaten path, that's for sure. Leaving Altoona, I took an old highway and drove north for maybe 15 miles to the small town of Tipton. Sure enough, right in the middle of town, there it was. 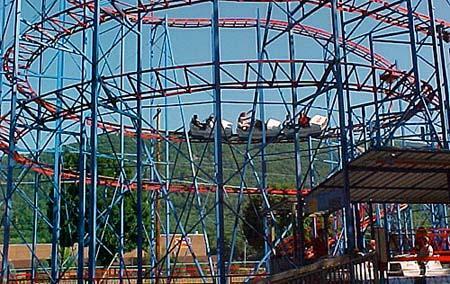 The bright blue and red Zyklon roller-coaster was just off to my left and free parking was available off to my right. My first impression from the road was that it looked like a small county fair. Once I parked my car and got out I saw a huge crowd of people hanging out by a building that said something like Texas BBQ. Well, being a Kansas boy, I am always looking for good barbeque. I walked up and asked the young lady what was good and she recommended their hot dog with chili and cheese. I decided to go for it. It didn't take long to get my food and even less time for me to devour it. I hadn't walked 15 feet before it was gone. Oh my God, it was so good I walked back and ordered another one! This time I made it as far as the waterpark, where I watched one of those big mega-gallon buckets fill with water, then empty itself onto the fifty or so kids waiting below. I think these things are hilarious! There was also a go-kart track and a large miniature golf course on this side of the park and all three attractions were packed with patrons. I walked across the overhead bridge and entered the main section of the park. There were a *ton* of people coming into the park for such a late hour, and a Sunday night at that! Many of them were carrying folding lawn chairs. I figured there must be some kind of family or church get together. My admission was $6.95. When I saw all that I was getting for my money I couldn't believe it. I immediately got on and this time I knew what I was doing. I clipped a branch several times. Man, I LOVE these things!!! After I got off one little kid asked me how I "did it" so I told him what to do and watched as he successfully piloted the Flyers. I looked around. Okay, this park is WAY cool. First of all, it does have a kind of permanent carnival atmosphere to it. But it's not cheap looking at all, everything is spotless, the buildings are nice, and the rides look to be in mint condition. And it's nice to see such a small park appear so vital and healthy and well attended. The crowd is noticeably young, junior high aged and older. Where did all the old people I entered the park with go? I heard Blands had good pizza, so I ordered a slice. I believe it was only a buck, and I couldn't believe how big the slice was. Man, was it good! This isn't cheap tasting pizza at all, it's very VERY good. I don't know which I like better between Blands and Holiday World, but both of these parks set a standard of quality for pizza that no other park I've been to comes close to matching. Photo courtesy of Theme Park Review I headed for the roller-coaster. While waiting in line a very pretty young girl asked me about my RRC button. I told her what it was and she said her name was Chris and she was crazy about roller-coasters. She told me her high school graduation present was a trip to PKD and she would be going next month with her mother to ride The Grizzly. We rode the coaster together and she chattered away the entire time, telling me about her plans for college and which coasters she wanted to ride. She also told me she'd met a boy here yesterday and was sure hoping he would come back tonight. I told her if he showed up she could ditch me and everything would be okay. The Zyklon has a really good first drop. Actually it's a spectacular first drop! But after that the brakes are applied in a heavy handed fashion all over the track. I really wasn't enjoying my rides as much as I had hoped. The pain in my side was just wearing me down and after six rides I couldn't take it anymore. I told Chris I needed a break and we went to the dairy building and ordered ice cream cones. It was great. Chris talked non-stop about her plans for the future and what boys in the park she thought were cute. Then we headed over to what looked like the biggest Round Up I have ever seen. This was a big mistake. The centrifugal force of the ride caused me excruciating pain. Worse still, the ride op ran the ride for over 5 minutes. The pain was incredible! I had to sit down on the exit steps after the ride ended for a few minutes. I told them I had a stomach ache. I got over it. We went over to the Flyers and rode two more times. Chris had never ridden them before because she thought they were stupid. But she loved it once she figured them out. Oh man, I could ride these all day! What fun! The ride op laughed when I asked if I could stay on. 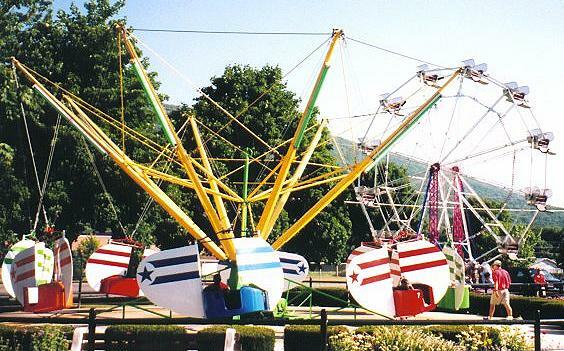 Oh man, if it's true the Flyers at Knoebels were even better than these then I was in for a real treat tomorrow! Chris wanted to go on the coaster again but I became afraid to ride it. Afraid of a Zyklon, how pitiful. I told Chris I would have to quit, at least for awhile, and I hoped her friend showed up. She wished me well and I headed for one last walk around the park. I came upon another food building - this one with *the potato salad. * Now I had heard about Blands potato salad so I really wanted to try it. It's kind of an odd thing to be known for, don't you think? Potato salad? But I kind of understand because of all the things my Mom makes I've always liked her potato salad the best. I also noticed they had some very tasty sounding sandwiches. I ordered a BBQ ham sandwich and some potato salad. "I'm sorry, sir, we just ran out of potato salad." "Yeah, not more than five minutes ago." "Oh come on, you're killin me here!" "Well I mean,.... don't you have ANY?" "No, I'm sorry, we don't have any left at all." "Well, can I at least lick the bowl?" "Oh my God!!! No, you can't lick the bowl!!" Everybody in the kitchen started laughing and came over to see the guy who wanted to lick the bowl. They gave me a nice big ham sandwich smothered in barbecue sauce and some chips and a pickle. I sat down at a small table and watched a HUGE concert going on in a *fantastic* tree shrouded pavillion area. So that's where all the people were going. It was an Up With People concert. I didn't even know they still existed! I used to go to Up With People concerts thirty years ago when I was kid! "Up, up with people, there's people wherever you go.... up, up with people, the friendliest people you know." A young couple in their late twenties walked up to me. The guy asked if I'd mind sharing my table with them. I told them no, but did they have any potato salad? No, I'm only joking of course. They sat down and were very nice, and I got the impression they were on their first date by the questions they were asking one another. While sitting there enjoying my dinner (and I do mean enjoying, their food really is fantastic!) I realized how comfortable I felt at this park. This is Everytown, U.S.A. I wish we had one of these in St. Paul. It's an extremely well run, very nice, very fun, very surprising park, and I can see why the locals support it so well. If I lived in Tipton I'd be here every Sunday night, too! I finished my sandwich and decided I'd better head out if I was going to make it to Lakemont before closing. On my way out I passed the pizza place again. I stopped, walked back and ordered a whole veggie supreme. Total cost, six bucks. I was completely full but figured I could eat it later that night and if it were half as good cold as it was hot I'd be more than satisfied. I may have breathed Idlewild, but I INHALED Blands! I drove to Altoona and checked into my room at the Econolodge. I thought about heading right over to Lakemont but felt like I was going to pass out so I decided to take a break. I called Susan and told her I thought I was in trouble. "You've got to go to the hospital." "No, I've got to go to Lakemont!" We talked for almost ninety minutes. I didn't want to go to a doctor because I was pretty sure it was severely bruised ribs and there was nothing they could do for me anyway. 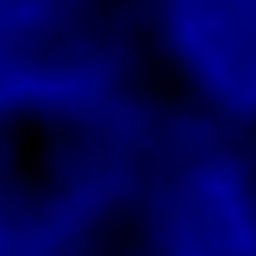 Susan, being the more practical one, asked me how I was able to discern bruised from broken, or even ribs from lungs. She always approaches things more cautiously than I. But there was no way was I going anywhere but the park. I figured the less I knew the easier it would be to get through this trip, which, I reminded her, was only three days old! I hurried to get to Lakemont. The park was scheduled to close in just under an hour and I wasn't even sure if they'd let me in this late. The Skyliner cut an impressive looking figure as I crossed over the highway and drove down to the parking lot. There wasn't even anyone at the gate so I just walked right on in. I had already bought my ticket at the Econolodge so it's not like I was stealing or anything, and I figured if anyone asked I would just give my ticket to them. The place was deserted. What a strange little park! The front was grand and seemed to suggest a much bigger park than what I saw before me. The entrance seemed totally out of character with the rest of the park. I wanted to do two things: look at Leap the Dips and ride the Skyliner, which would be my 75th roller-coaster. I began to head for it when I spotted a ride I had never seen before. It was the Toboggan. 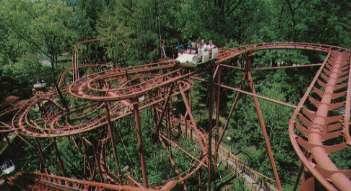 I wanted to ride it but knew there wasn't time, and besides I figured out Leap the Dips was just ahead so I wandered around to the back to see what the oldest wooden roller-coaster in the world looked like. Photo courtesy of Theme Park Review I was shocked at what I saw. It looked awful. The coaster looked as though it had been left to fall apart. The sight of all that rotted wood, peeling paint and missing track made me depressed. There were pieces of old wood everywhere. A little bit of work had been done on what looked like a storage or lift shed, but it was very minimal and besides, it was completely overshadowed by the strange, sad roller-coaster just rotting away in front of me. The crown on the lift hill looked eerie, and I suddenly became aware that I was completely alone in what felt like an abandoned area of the park. I walked away feeling dejected and hoping that the restoration project would be successful. As I headed toward the Skyliner the sun began to set. The only activity in the park seemed to be The Toboggan, the go-karts and Skyliner. The Skyliner was a walk on, and I chose a seat toward the front. I figured the forces would be less extreme in the front, thereby bettering my chances for a reride. Following this night I would try to keep my backseat rides to a minimum for the remainder of my trip. The Skyliner has the most interesting rolling stock I've ever seen, and it's one of my favorite. Single lap bars, no dividers and the seats are the most cushiony I've ever felt! And yet they do NOT look old! The trains are painted in funky colors with purple the dominate color scheme. I'm guessing they're newly refurbished. Photo courtesy of Joyrides The ride itself was great fun. 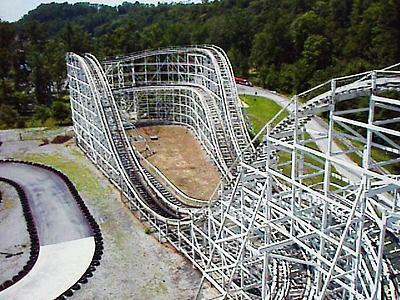 The first drop delivers loads of airtime. 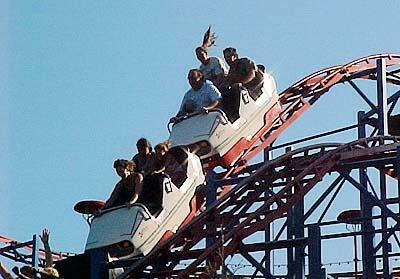 I caught a young boy riding in front of me on videotape as he popped out of his seat - he had great coaster hair! 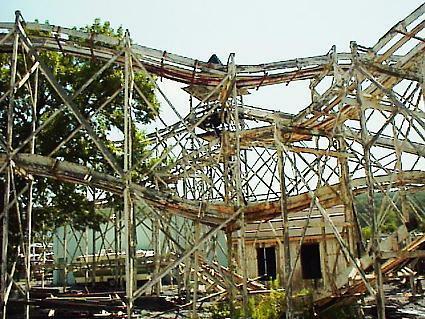 The third drop has a nasty little pothole, but other than that the ride is smooth and fast and has a number of different elements and forces. I got three rides on it and I'm convinced it's the most underrated coaster in the world. Thank you Dave Althoff for suggesting I ride this beauty at night! The ride ops shut down the Skyliner for the night and as the last of us walked down the exit ramp a man came riding up in a cart. He saw my coaster shirt and said "I'm gonna take a wild guess here and say you're an ACE member!" I said that I was and he introduced himself as Pete Carmichael, the ride operations manager for the park. As he walked around closing down the park we talked at length about the Skyliner and the upcoming Coaster Con at Kennywood. He was an extremely amiable guy and very easy to talk to. The final image I have of this park was the Skyliner, lights out and dark, with just a sliver of the sun barely visible behind it. I couldn't think of a more fitting way to end this memorable day. I made it back to my room and put my pizza on the dresser, where it remained untouched for the rest of the night. This was the first day I had ever gone to a park by myself, yet I never once felt alone. As I tried to ease myself into bed I finally felt the first pangs of self-pity creeping in. Pain has a way of reminding us how alone we are in this world. Tomorrow I'm going to find a friend.